Today’s photo is a snapshot of my pencil jar. As soon as I locate my pencil sharpener, I’m going to sharpen all of them. 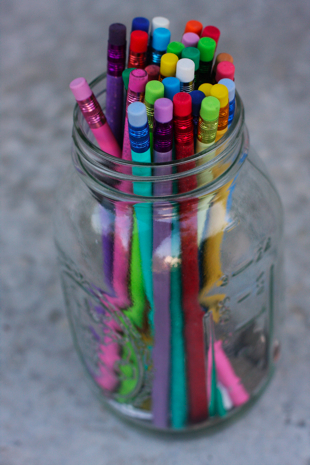 There’s something very inspiring about a jar of colorful sharpened pencils. It obviously doesn’t take much to amuse me. (I even like it when the jar is full of regular yellow pencils.) I’m sharing this because I believe it’s important to make a point to celebrate the beauty of every day things. So, what simple little thing amuses you? Do you have a pencil jar, too? Tell me about your favorite things. Hello.This article was extremely remarkable, particularly because I was investigating for thoughts on this topic last Sunday. I do agree with all of the ideas you have presented in your post. They are really convincing and will definitely work. Still, the posts are very short for newbies. Could you please extend them a little from next time? Thanks for the post. A formidable share, I just given this onto a colleague who was doing a little bit evaluation on this. And he in actual fact purchased me breakfast because I discovered it for him.. smile. So let me reword that: Thnx for the treat! But yeah Thnkx for spending the time to discuss this, I really feel strongly about it and love studying extra on this topic. If potential, as you change into expertise, would you thoughts updating your weblog with extra details? It is extremely helpful for me. Big thumb up for this blog put up!